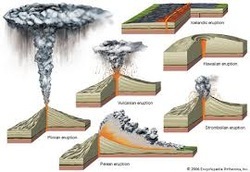 Intraplate Volcanism is an igneous activity that occurs within a tectonic plate away from any boundary. The Hawaiian Islands are a great example of intraplate volcanism, as they are situated in the middle of the Pacific Plate. 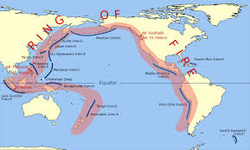 The Ring of Fire is an area where a large number of earthquakes and volcanic eruptions occur in the basin of the Pacific Ocean. It circumvents the Pacific Plate, and is responsible for the creation of the Andes Mountains, the Cascade Mountains Range, The Aleutian Islands, and Japan. All of these regions are known for their volcanism and earthquakes. Lava refers both to molten rock expelled by a volcano during an eruption and the resulting rock after solidification and cooling. 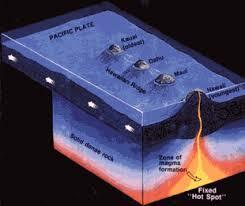 The viscosity of lava is important because it determines how the lava will behave. 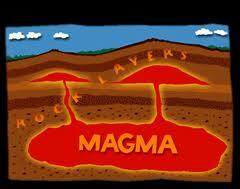 Magma is a mixture of molten or semi-molten rock, volatiles and solids that is found beneath the surface of the Earth. 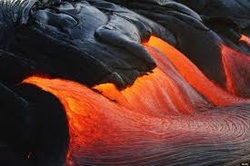 The difference between magma and lava is that magma is below the surface of the Earth and Lava is when it comes out onto the surface. Viscosity is a measure of resistance of a fluid or liquid to "flow". Think of viscosity as "thickness". 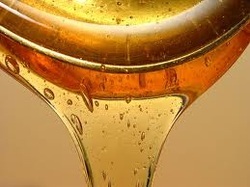 For example, honey has a higher viscosity than water. When talking about volcanoes, magma with a greater viscosity (thickness) will typically create more violent and destructive eruptions. Arc-type volcanoes are usually violent with highly viscous lava, where shield volcanoes have typically less viscous and flowing lava (Hawaii). The amount of silica content controls the viscosity, or thickness of the magma. The higher the silica level, the more viscous the magma is; therefore, the volcano eruption is greater and more explosive.